PHILADELPHIA – Women have smaller, more breakable nerve fibers in the brain compared to men that may make them more susceptible to concussions, suggests a new study from Penn Medicine neuroscientists published online today in the journal Experimental Neurology. In a series of laboratory tests using rat and human neuronal cells, the research team, led by Douglas H. Smith, MD, director of the Penn Center for Brain Injury and Repair and the Robert A. Groff Professor of Neurosurgery at the Perelman School of Medicine at the University of Pennsylvania, found that female axons were smaller and had fewer microtubules – "train tracks" that transport molecules up and down the axons – that were more likely to break after applying the same amount of force from a simulated traumatic brain injury. That breaking is what researchers believe may lead to symptoms associated with concussions, such as dizziness or loss of consciousness. The susceptibility may also help explain why female athletes have an increased risk of concussions and worse outcomes than male athletes, as previous studies have shown. "The paper shows us that there is a fundamental, anatomical difference between male and female axons," Smith said. "In the male axon, there are a great number of microtubules, which make the entire structure stronger, whereas in female axons, it's more of a leaner type of architecture, so it's not as strong." Considered the "electric grid" of the brain, axons are long, slender parts of the neuron that communicate messages from one cell to another. When someone suffers a traumatic blow to the head, the axons are stretched at a very rapid rate. While the axons typically stay intact, their microtubules can break under the strain. The faster they stretch, the stiffer the crosslinking proteins known as tau become. This transfers high stress onto the microtubule that can result in them rupturing, setting off a molecular imbalance. "You can imagine that if something goes wrong with that transport system, the cargos get dumped out and start to pile up and that will create a huge problem," Smith said. This buildup causes abnormal inflows of sodium and calcium ions. Researchers believe that levels of calcium become high enough to trigger a self-destruct process, in which protein-breaking enzymes are unleashed, begin to degrade the axonal structure, and ultimately compromise the nerve fiber. The researchers found that 24 hours after trauma, female axons had significantly more swellings and a greater loss of calcium signaling function than male axons. "When axons function normally, they let sodium pass through the membrane, and it creates a spark that can be transferred as 'electricity' down the axon," Smith said. "In concussion, you can have immediate loss of that ability to transfer that 'electricity.' That's why the characteristic, behavioral changes occur." People who suffer from concussions – about two million sports-related concussions occur in the United State every year – can experience confusion, headaches, dizziness, and temporary loss of consciousness, which typically disappear after a few hours or days. Recent Penn studies have also suggested that concussions can lead to long-term cognitive impairments. 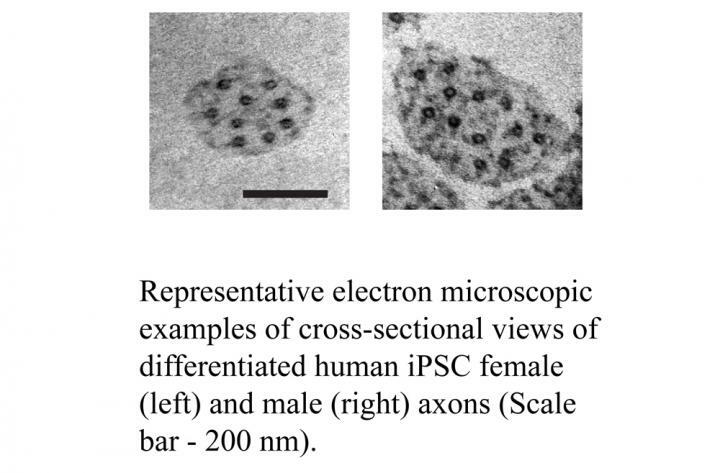 The researchers, which included first author, Jean-Pierre Dolle?, PhD, of the Penn Center for Brain Injury and Repair, used transmission electron microscopy to study the structural differences between female and male axons from both rat and human neurons. Next, they evaluated the axons' response to dynamic stretch injury, to mimic a traumatic axonal injury, using computational and in vitro models. Past studies have shown that female athletes have a higher rate of concussion and appear to have worse outcomes than their male counterparts participating in the same sport, the researchers noted in the current study. Also, results from a 2017 study, presented at this year's American Academy of Neurology's annual meeting, found that women athletes are 50 percent more likely than male athletes to have a sports-related concussion. The in vitro findings, researchers said, may have implications for concussion, where axonal injury is the most commonly described pathological feature. "It is conceivable that under the same level of mechanical loading during head impact, axons in female brains may be more susceptible to damage than axons in male brains due to fundamental differences in axon ultrastructure," they wrote. Further in vivo studies are needed to support these findings, Smith said. One next step would be to compare blood biomarkers. For instance, do concussed females have more axon proteins, which rise in the blood after a concussion, than males? SNTF (alpha II-spectrin N-terminal fragment), and APP (amyloid precursor protein) are two examples of biomarkers of axonal injury, Penn researchers reported in previous studies. Investigating white matter changes in male and female athletes playing the same sport with advanced neuroimaging is another avenue to explore, Smith said. The findings also point researchers to potential treatment options to study, including microtubule-stabilizing drugs that would help reduce microtubule breakdown in the wake of brain injuries. "We have a couple avenues to look at to help this ion imbalance, to get the lights back on, to get the network to better function after injury, and at the same time prevent the microtubule from falling apart," Smith said. Co-authors on the study include Andrew Jaye, Stewart A. Anderson, Hossein Ahmadzadeh, and Vivek B. Shenoyc. The work was supported by the Paul G. Allen Family Foundation, National Institutes of Health (NS092398, NS038104, EB021293, MH110185) and the US Department of Defense (PT110785).